This is an amended version of a talk I gave in Bath in the spring of 2007, as part of the commemorations of the bicentenary of the abolition of the slave trade. For copyright reasons I have not quoted directly from Wilberforce’s journals or any other manuscripts. The full quotations and the references can be found in my book. I didn’t realize until I did a word search how often Bath crops up in Wilberforce’s correspondence! Because of his very indifferent health he was frequently in the town even though he complained on 20 April 1826 that Bath was one of the worst possible places for finding any leisure in the morning, because the door knocker was continuously going. That sociable city was not the place for quiet reflection or sustained reading. The first record I have found dates from November 1786, when he was in his late twenties, where his diary records that when in Bath he gave way to what he called ‘intemperance’. I’m not sure that should mean that he was drunk! This was the period of his evangelical conversion and he was very hard on himself for any lapses from high standards. Two years later, he went to Bath again so sick that many thought he was dying. He recovered, but his illness meant that his parliamentary motion for the abolition of the slave trade had to be delayed for a year; it took place in May 1789 rather than in 1788 as had been planned. In 1811 he bought an estate at West Wick between Bath and Bristol, though as an investment rather than a place of residence. By this time he was a married man, the father of six children. He had met his wife at Bath and they were married at Walcot church, the same church where Jane Austen’s parents had been married. So this is the first love story I am going to tell. The second – a less happy one – relates to his younger daughter, Elizabeth. For most of the 1790s Wilberforce was urgently – at times frantically and often irrationally – looking for a wife. Yet to many observers he seemed the epitome of the confirmed bachelor. Certainly that is how Dorothy Wordsworth saw him. What woman would be expected to keep up with his frantic and disorganized life? Wilberforce’s quest for a wife was inspired by two strong forces working within him: his sexual needs that could only be legitimately satisfied in marriage, and a wistful envy when he saw the happy marriages of his friends. Those who knew him well quickly picked up on his need for domestic companionship and were keen to offer advice. The clinching piece of advice was to be provided by his close friend, Thomas Babington, MP for Leicester and a fellow Evangelical. Early in 1797 Wilberforce completed his book A Practical View of the Prevailing Religious System of Professed Christians … Contrasted with Real Christianity. On 12 April he set off for Bath and the following day a triumphant Babington told him he had found him a wife: a Miss Barbara Ann Spooner, twenty-five years old (not twenty as many of Wilberforce’s biographers state), and the eldest daughter of the Birmingham merchant, Isaac Spooner. The family spent a great deal of time in Bath because of Isaac’s health. The Spooners owned Elmdon Hall in Warwickshire (now in the suburb of Edgbaston). They were well-to-do but the family was large and Barbara’s fortune was the relatively modest one of £5,000. But money was never a consideration for Wilberforce. Nowhere in his journals does he show any particular interest in how much money his putative bride would bring him. He had two criteria, neither of them negotiable: she had to share his Evangelical convictions and she had to be ‘affectionate’. (This was a man who craved affection more than anything else.) As it happened Barbara Spooner was to pass on both counts. She was also, as her surviving portrait shows, extremely attractive with dark hair and expressive eyes. The couple met on Saturday 15 April (unfortunately we don’t know where), and at the end of the day Wilberforce felt he had been gauche and came away ‘irritated and sad’. The following day was Easter Sunday and during a not very impressive sermon his mind was distracted by Miss Spooner. He was, he recognized, in danger of falling in love with a creature of his own imagination. He dined with Babington and the Spooners in the evening and was convinced that he was in love. So blatant were his attentions that the following evening he found Barbara ‘irritated’ as his attentions were now ‘public news’ in Bath. The city, it seemed, was alive with gossip that Wilberforce was in love with a woman he had met two days previously. For this rest of the week the couple were seen in public at the Pump Room and by the Saturday Wilberforce could describe himself as ‘captivated’ by her’. True to his usual practice he consulted friends, this time Hannah More and his second cousin Henry Thornton, who understandably advised him to slow down. But he thought they were ‘imperfect judges’. Of course they were both seriously alarmed. What was to become of the great causes of evangelicalism and abolition if their foremost proponent made a public fool of himself? On Monday 24 April, nine days after meeting Barbara, Wilberforce had the necessary interview with Mr Spooner, and the following day he made his engagement public by escorting her to the Pump Room. He now had leisure to assess his fiancée’s character. He thought her ‘good’ and ‘natural’, but also ‘wild’, by which he seems to have meant spontaneous. On the Saturday he received a message from the Prime Minister William Pitt, that he was needed in London in order to give support to a controversial loan to enable Austria to continue her war against Revolutionary France. After they had breakfasted together, he took leave of her. Once in London, in the grip of another bout of illness, quite possibly psychosomatic, he had time to reflect on his rash action: had he yielded to his physical appetites and entered into an irrevocable commitment? Yet he trusted that Barbara really was a child of God. At the end of May as the time approached for him to return to Bath and his marriage, he lamented how much of his time had been frittered away. The war was going badly, the country was in dire straits, and in his heart of hearts he did not care! At the wedding service, which took place on 30 May at Walcot church (the same church where Jane Austen’s parents had married) , it was Barbara who was tearful and Wilberforce who felt no emotion. After a courtship of six weeks, he had worn himself out mentally. Their honeymoon was spent on a tour of Hannah More’s schools in the Mendips. The couple returned to Bath later in the year and according to my calculations, their first child, William Wilberforce junior, was conceived in Bath around 20 October. Not all his friends thought Wilberforce had made the right choice of a wife. Dorothy Wordsworth was not alone in thinking Barbara good-hearted but whiney and sanctimonious. The criticisms can be summed up as follows: far from being worthy of her great husband, Barbara was a trial to his patience; she was incapable of stimulating conversation and in her anxious protectiveness she stifled his conversation with his friends; she possessed to an uncomfortable degree the evangelical vice of speaking in cant religious phrases. She was also incapable of running a smooth, efficient household, and at the chaotic breakfasts in the Wilberforce household, guests were expected to fend for themselves and sometimes had to be prepared to go hungry – though one doubts whether any wife could have coped easily with such a constant stream of visitors. Her children, too, found her a trial because of the way she fussed over them. Her vivid imagination found it all too easy to picture them in all sorts of dire perils, both physical and moral. For example, when she heard that her youngest son, Henry, had written home from his brother’s alone and at night, she conjured up a picture of him falling from his horse and lying injured in a ditch, his life slowly ebbing away. The children either laughed it off or gritted their teeth. Yet Wilberforce never regretted his marriage. 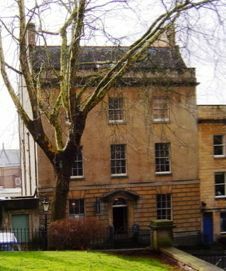 As a married couple, the Wilberforces visited Bath frequently, most sadly in 1821 when their elder daughter was taking the waters to cure the tuberculosis that was to kill her early in 1822. They were celebrities in the city. In 1824 the surviving daughter Elizabeth reported that people were forking out considerable sums of money to buy Barbara’s drawings. In Bath three years later, Elizabeth presented the family with a major crisis when she announced her wish to marry Charles Pinney, third son of the Bristol merchant, John Pinney, who was the owner of a substantial slave estate in Nevis. His youngest son Charles had been born in 1793 in the house in Great George Street now open to the public as the Georgian House. Charles inherited his father’s business skills and when John Pinney died in 1818 he inherited the Bristol house and the Nevis property – and the slaves. Some time in the mid-1820s he met the Wilberforces probably through their common friend, John Scandrett Harford, I suspect either in Bath or at nearby Blaise Castle. Whatever the location, in April 1827 the family were at no 3 Queen Square where Wilberforce was approached by Pinney who asked him for his daughter’s hand in marriage. With what seems like astonishing naivety, Wilberforce responded sympathetically. In his letter to Pinney he discussed the possible marriage settlement but made not mention of his prospective son-in-law’s substantial interests in the West Indies or in the fact that he was also involved in granting mortgages to planters in need of funds. This was worse even than being a slave-holder as he was involved in slavery at a distance and had no control over the working conditions of the slaves. The day after Wilberforce in effect agreed to the marriage, he received a blistering letter from his abolitionist brother-in-law, James Stephen which distressed him so much that he became ill. Barbara suggested that the family travel to Leicestershire to consult the family oracle, Thomas Babington. A week later they set off. Of course in theory the choice rested with Elizabeth. At the age of 26 she had the legal right to make her own decision. But what could she do? After listening to Babington Elizabeth broke off the relationship. As her mother put it in an apologetic letter to Pinney’s sister, Mary Ames, she could not destroy her father’s peace of mind. Wilberforce noted with relief in his diary that she did not seem too troubled by her decision, but the next day he had to report that she had been confined to her room all day with a headache. The crisis was over – but not without its casualties. Elizabeth’s thoughts on the subject have not survived, but it must have been an extremely depressing time for her. I wish I could provide a happy ending for Elizabeth. In January 1831 she married a clergyman, the Rev John James of Lydney, and went to live in his poor Yorkshire parish at Rawmarsh. By this time she was already suffering from a hacking cough. In October she gave birth to a baby daughter, Barbara. She then went rapidly downhill and died in the Isle of Wight in March 1832. By this time Wilberforce himself had not long to live. In May 1833 he was back in Bath and clearly dying. The waters seemed to be doing him good, and he was able to walk on the Parade for half an hour, but this was a false hope. The Wilberforce family were very good at unrealistic optimism. On 17 July Wilberforce left Bath for the last time to seek the advice of London doctors. On 26 July he heard that the Anti-Slavery bill had passed its third reading. He died at 3 am on 29 July a few weeks before his seventy-fourth birthday, and with him died most of the family’s connection with Bath. Barbara Wilberforce does not seem to have visited it often if at all after her husband’s death. But then perhaps Bath’s glory days were over? I have been privileged to be able to use for my book, both on the cover and in the text (pp. 108 – 109), the companion portraits in pastel (each 61 x 44.5 cm) of William and Barbara (née Spooner) Wilberforce by John Russell (1745-1806). William’s portrait is dated 1801. Russell was one of the great pastellists of the age, and he completed few commissions in oils. Interestingly, however, there is a Russell version in oils of the Wilberforce portrait, larger in size and with a somewhat grander background. This is an oil on canvas, 76.2 x 63.5 cm, and it is in the collection of the Leeds Museums and Galleries. The portrait may be viewed online as part of the BBC’s ‘Your Paintings’ Project [for further details, see: Neil Jeffares, Dictionary of pastellists before 1800, Part II: Named Sitters L-Z]. Jeffares also records, sadly as ‘lost’, a pastel of Mrs Wilberforce of Wimbledon [née Hannah Thornton], the beloved aunt of the young William Wilberforce.